Using her platform to shutdown trolls is one of many messages Clinton shares in her new book "Start Now! You Can Make a Difference"
Chelsea Clinton says she's naturally an optimist and despite enduring name-calling from the time she was a child, she chooses to answer insults — even on Twitter — with kindness and respect. "Cyberbullying is a huge challenge across our country. I think we need those of us with platforms to not ignore the trolls, not to become consumed by them, but to shine a light and say here's how you can respond where you're calmly defending yourself but you're also showing it's not OK and you're not degrading your own humanity in doing that," the 38-year-old mother of two said in an interview Tuesday with The Associated Press. It's one of several messages in her new book, "Start Now! You Can Make a Difference," released this week. In it, Clinton encourages children to make a positive change in the world by educating themselves and taking action. The book focuses on preserving the environment, helping save animals, staying healthy and putting an end to bullying. "Start Now!" is Clinton's fourth children's book. 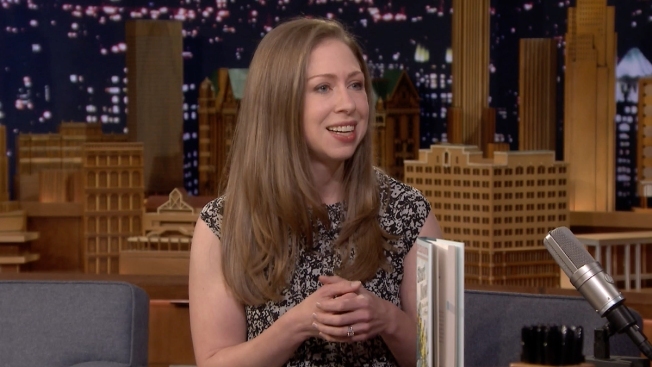 Her role as an author is one of several that Clinton juggles, including motherhood, being vice chairman of the Clinton Foundation and teaching at Columbia University. Her latest book was inspired by the notion that age doesn't matter when it comes to activism. "I've always believed that you're never too young or too old to make a difference. And then when I became a mom, I think I felt that even more keenly because all of a sudden I had, you know, first Charlotte and then Aidan, these little people in the world, I wanted the world to be a healthier, more equitable, more just safer place for them than previous generations," she said. Making the world a safer place, in Clinton's eyes, also means abolishing bullying. It's a topic Clinton knows only too well, enduring brutal criticism of her looks when she was growing up in the White House ("Saturday Night Live" did a skit poking fun at her at the time). There were also those who targeted her because she was the daughter of Bill and Hillary Clinton. "So when I was confronted directly — even as a child — and people would say awful things to me, I would say, 'I'm sorry you feel that way. I don't feel that way. I don't think I'm ugly or born in sin or the family dog or that my parents should have aborted me or you know that like we all should be dead,'" she recalled. "I mean these are all things that people said to me when I was a kid and they were always said by much older people." Decades later, the taunts still come — these days via social media. At first Clinton ignored them, but recently she started to speak up. "I started to worry that by ignoring it, it wasn't depriving the trolls of oxygen, it was maybe taken as kind of implicit — not endorsement — but that I was somehow OK with that language and that behavior," she said. "And I think particularly being a parent now I never want my kids or any kid to think that that's OK."
She added: "And I do think even if you don't agree with me politically it's never OK to attack me personally in the same way, like if I don't agree with you politically it's never OK for me to attack you personally, and so I want my children to see their mom standing up for respect and kindness and to know that that is not a sign of weakness." Clinton pointed to a recent mention of her family that came from Supreme Court nominee Brett Kavanaugh as he defended himself against sexual assault allegations in a combative hearing on Capitol Hill. He said allegations against him came from Democrats seeking revenge over the Clintons; Kavanaugh was an investigator for Kenneth Starr, who led the probe of then-President Bill Clinton that led to his impeachment. While Clinton had already opposed Kavanaugh — in part over concerns about abortion rights — when he mentioned her family, her feelings were cemented. "I thought, 'Oh goodness like judge Kavanaugh, I don't even think I knew who you were until you were nominated.' So clearly we were looming larger in your mind than at least you were looming in mine," she said. "But even if he'd gone after a former Republican president or a current Republican senator or politician I would feel the same way, that that kind of blatant partisanship should be disqualifying." While Clinton worked for her mother during the 2016 presidential campaign, she's hoping the people who pick up "Start Now!" will be Democrats and Republicans. "And I hope that children whose families come from across the political spectrum would read this book and then think about how to channel whatever kind of their political values are ... into issues that they care about."